A VERY UNIQUE PIECE OF FURNITURE FOR ALL LOVERS OF PEAKY BLINDERS. WE FINISH THE TRUNK IN A LOVELY SLATE GREY ,THEN GIVE THE RETRO USED LOOK AND APPLY OUR OWN CUT STENCIL SIGNS. PEAKY BLINDERS. FRESH WHISKEY. A VERY UNIQUE PIECE OF FURNITURE FOR ALL LOVERS OF INDIANA JONES. WE FINISH THE TRUNK IN A LOVELY SLATE GREY ,THEN GIVE THE RETRO USED LOOK AND APPLY OUR OWN CUT STENCIL SIGNS. DO NOT OPEN. PROPERTY OF DR JONES. 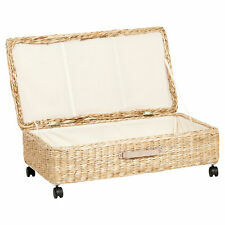 Ideal storage chest for bedding, clothes, shoes, toys etc. Under Bed Storage Box. Perfect for bedrooms with limited space. Storage depth: 14.5cm. Cotton lined. Width: 76cm. WE FINISH THE TRUNK IN A LOVELY SLATE GREY ,THEN GIVE THE RETRO USED LOOK AND APPLY OUR OWN CUT STENCIL SIGNS. WE CAN PERSONALISE. ALL THEN COATED IN WATER BASED SEALER/VARNISH. THE HINGED LID HAS COTTON CUSHION FILLED WITH TOP QUALITY AND VERY COMFY STUFFING. New With Leather belt locking and leather hinges. H50 x W90 x D55 cms. Solid mahogany Sleigh Blanket Box / Chest. Sleigh Blanket Box OCS040. Handcrafted from solid mahogany wood which is only sourced from sustainable plantations. Solid mahogany Gothic Blanket Box / Chest. Gothic Blanket Box OCS001. Gothic carving. Handcrafted from solid mahogany wood which is only sourced from sustainable plantations. Finished with a traditional wax polish to enhance the colour of the natural wood. Wicker Chest Storage Trunk. Made from natural wicker. Deep - 52 cm. Width - 90 cm. 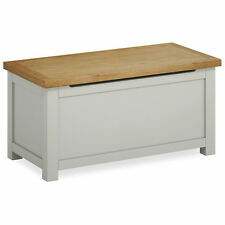 This is a great storage box from our Lyon Range. Ideal for placing in the bedroom, nursery, hallway or living room. Matching furniture that will allow you to create the perfect living space. Colour: Cream. Grey rattan lidded storage trunk. hallway show storage. bespoke lifestyle storage basket. great for bedroom blankets. Recently sanded down and given a clear varnish it will make a decent blanket chest or easy stylish coffee table conversion. Width: 64cm. 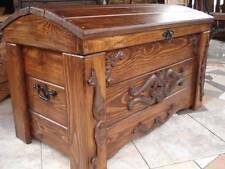 Wicker Chest Storage Trunk. Made from natural wicker. We Have Other Wooden/Wicker Accesoriess Available. Deep - 50 cm (20 "). Width - 80 cm (31 "). 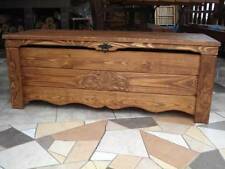 Vintage Oak Panelled Linenfold Carved Blanket Box Storage Coffer Trunk. Trunk is W51 x D31 x H36cms approx. They cannot have been assembled and disassembled. This Panama Blanket Chest adds significant storage space to any room. Ideal for bedding and blankets. Storage Space 36cm H x 76cm W x 36cm D. Product Type Blanket Chest. Wood Construction Details MDF. Colour - Palisander . Wood thickness - 2.1cm - 2.3cm. Height - 40 cm ( 15.8" ). Colour - Varnish - Palisander . Wood thickness - 2.1cm - 2.3cm. Height - 50 cm ( 19.7" ). Colour - Wenge . Wood thickness - 2.1cm - 2.3cm. Height - 38 cm ( 15" ). Colour - Varnish - Wenge . Wood thickness - 2.1cm - 2.3cm. Height - 45 cm ( 17.7" ). You Can Easily Paint It. Height - 45 cm ( 17.7" ). Colour - Oak . Wood thickness - 2.1cm - 2.3cm. Height - 45 cm ( 17.7" ). Colour - Palisander . Wood thickness - 2.1cm - 2.3cm. Height - 48 cm ( 19" ). Colour - Oak . Wood thickness - 2.1cm - 2.3cm. Height - 38 cm ( 15" ). Colour - Varnish - Teak . Handmade - Pine Hard Wood. Wood thickness - 2.1cm - 2.3cm. Width - 50 cm ( 19.7" ). Handmade - Pine Hard Wood. Colour - Varnish - Oak . - all our trunks are handmade and each one is prepared individually. Height - 50 cm ( 19.7" ). You may need 2-3 people to carry the item. Colour - Varnish - Wenge . Wood thickness - 2.1cm - 2.3cm. Height - 50 cm ( 19.7" ). H50 x W90 x D55 cm. Solid mahogany Sleigh Blanket Box / Chest. Handcrafted from solid mahogany wood which is only sourced from sustainable plantations. Although mainly internet based we do have a showroom. To carry the item. Colour - Varnish - Walnut . Wood thickness - 2.1cm - 2.3cm. Colour - Varnish - Oak . Handmade - Pine Hard Wood. Wood thickness - 2.1cm - 2.3cm. Width - 55 cm ( 21.7" ). Colour - Varnish - Wenge . Wood thickness - 2.1cm - 2.3cm. Height - 50 cm ( 19.7" ). Colour - Varnish - Palisander. Wood thickness - 2.1cm - 2.3cm. Height - 50 cm ( 19.7" ). Colour - Varnish - Oak . Handmade - Pine Hard Wood. Wood thickness - 2.1cm - 2.3cm. Width - 50 cm ( 19.7" ). Handmade - Pine Hard Wood. Wood thickness - 2.1cm - 2.3cm. Width - 50 cm ( 19.7" ). Cream and Gold Gothic Blanket Box / Chest. Gothic carving. Handcrafted from solid mahogany wood which is only sourced from sustainable plantations. Although mainly internet based we do have a showroom.